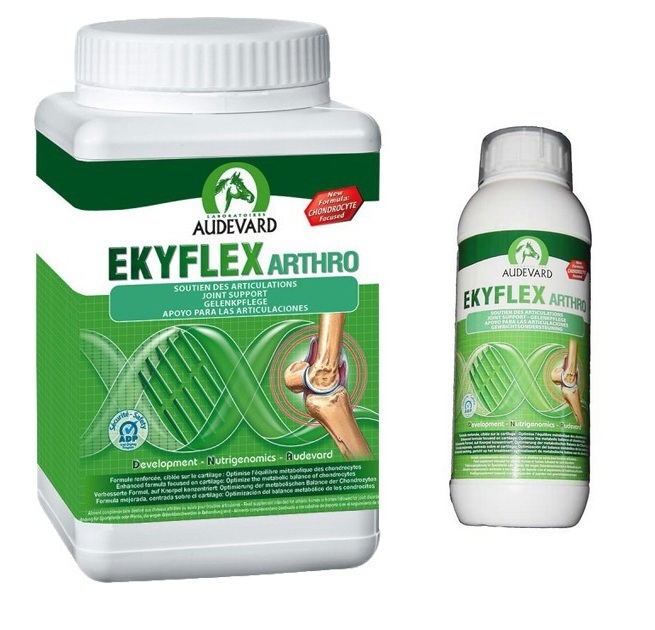 Ekyflex Arthro is a complementary food from Audevard which has been specially formulated to provide nutritional support tailored to the needs of intensive joints of horses. It consists of more than 75% of validated and innovative ingredients. Each measure provides 6g of collagen hydrolyzate low molecular weight thereby promoting assimilation by the body. Glucosamine, chondroitin and MSM have also been added for their superior quality and the plant extract, turmeric, completes the formula. Joint disorders are the leading cause of reform of horses so it is important to provide essential nutrients to the cartilage throughout the horse's life. Regular use of Arthro is a good investment for the mobility of the horse throughout his life. Apple cider vinegar, vegetable glycerin, glucosamine sulfate, hydrolysed marine collagen, MSM, turmeric ( Curcuma longa ), chondroitin sulfate, black pepper ( Pipper nigrum ). Glucosamine sulfate (2KCL), hydrolysed marine collagen, MSM, turmeric ( Curcuma longa ), calcareous seaweed, alfalfa microfinée, beet molasses, oyster shells, microfinée carob protein concentrate soybean, marine chondroitin, black pepper ( Pipper nigrum ). Intensive Need: 1-2 scoops daily for 4-6 months. Below are some recent questions we've received regarding Audevard Ekyflex Arthro for Horses, including answers from our team. Is it safe to feed to horses prone to gastric ulcers? This should be fine for your horse it it is given along with plenty of fibre. I would not add it to a cereal-based food for your horse. Obviously there are lots of other factors involved in the development of ulcers and you should bear these in mind of course. Turning out onto good pasture, reducing "stressful" exercise and feeding alfalfa can all help. Hi, I have a 4 year old made that had a bad accident as a yearling... It has resulted in her getting arthritis now... She is stable and is on a green lipped base supplement, she goes out everyday and is happy but I was wondering if this product is ok to be given to a pregnant mare? This is not a licensed medicine so it has not been scientifically tested. This means that nobody can say with certainty if it is safe. However having said that I can confirm that it has been used very widely during pregnancy and is generally regarded as being perfectly safe. You should check with your own vet about this, but personally I think you should be fine to continue to use the supplement at the usual recommended feeding amount.